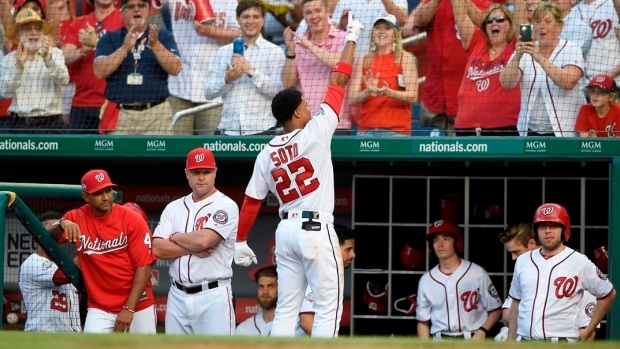 WASHINGTON — Juan Soto, the youngest player in the majors at 19, has hit a three-run homer in his first career start for the Washington Nationals. A day after striking out as a pinch-hitter in his big league debut, Soto connected in the second inning against San Diego on Monday night. The drive travelled an estimated 442 feet at Nationals Park and earned him a standing ovation from the crowd. He responded by taking a curtain call. The promising outfielder hammered the first pitch from San Diego starter Robbie Erlin over the Nationals bullpen in left-centre field. Soto was called up to Washington on Sunday, becoming the first 19-year-old to make his major league debut since Dodgers pitcher Julio Urias in 2016. Soto entered in the eighth inning as a pinch-hitter. Washington's starting left fielder began the season at Class A Hagerstown and played for three minor league teams this season, hitting a combined .362 with 14 homers and 52 RBIs. Soto joined Bryce Harper, who made his big league debut in 2012, as the only Nationals players to reach the majors at 19. "He's going to get a chance to play," manager Dave Martinez said Sunday. "I want to put him in situations where he can succeed."